SANY America’s new 550 U.S. ton crawler crane will satisfy a niche between 440- and 660-ton machines and is ideally suited for construction of wind energy towers, fossil fuel plants, nuclear facilities, petrochemical installations and a variety of infrastructure projects. The SANY SCC8500 has a host of exclusive and in-demand features to meet the needs of customers in a range of applications. It was first displayed at the Bauma China trade show in late November. The SCC8500 is especially well-suited for construction of 330-foot (100 m) wind towers and placing 2.5-megawatt nacelles. The SCC8500 can do these lifts with a straight boom and an offset wind tip, with no need for a back mast. With a full complement of attachments and options, including fixed jib, luffing jib and the SANY UltraLift package, the SCC8500 is a great solution for construction of nuclear, petrochemical and wind power; and on infrastructure projects such as bridges, waterways, dams and sewage-treatment plants. The SANY-exclusive ACE (auto counterbalance equalization) System senses the boom angle and uses hydraulic cylinders to automatically adjust the position of the movable upperworks counterweight. The standard ACE System has one upperworks tray with hanging brackets and 20 upper sideblocks for 478,404 pounds (217 000 kg) of counterweight. The ACE System design avoids an inefficient carbody counterweight and keeps overall crane weight down. The base machine transports on 21 trucks, the same as a standard 440-ton crane. With the ACE System, the SCC8500 doesn’t need a counterweight wagon, making it much more mobile on the job site. The optional UltraLift package includes a second counterweight tray with hanging brackets and 36 upper sideblocks for 868,621 pounds (394 000 kg) of counterweight. A second pair of hydraulic cylinders extends the counterweight beam to 52 feet 6 inches (16 m). The counterweight beam is supported by a back mast in the UltraLift configuration. 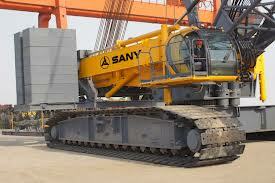 The SANY-exclusive UltraCab puts a premium on operator performance and comfort. The sleek lines of the cab’s exterior reflect the operator-friendly features inside. Styled by the Porsche Design Studios, the cab has a wide field of reinforced glass for commanding views of the load and the job site. The cab’s steel frame has overhead structural plates for added security. Cab air-conditioning and heating is powered by an auxiliary diesel generator. The UltraCab tilts up 20 degrees for optimum visibility. The large, high-resolution display shows crane gravity and many other monitoring statistics in real time. The proprietary SANY load moment indicator automatically detects lifting capacity, boom angle, top height and radius to ensure reliable operation. A closed-circuit television system gives the operator views of all winches, the counterweight and job-site surroundings. An anemometer on the boom tip monitors wind speed and transmits the data to the in-cab monitor. An electronic level indicator displays data on levelness of the crane. Ground pressure can also be displayed on the control panel. Pressure-compensated drive motors on each end of the tracks can be independently operated for forward and reverse travel, pivot steering and counter-rotation. The hydraulically driven system offers better gradeability in adverse ground conditions. The SCC8500 has 10 available configurations for main boom, fixed jib and luffing jib. Maximum main boom length is 354.3 feet (108 m) on the basic machine and 393.7 feet (121.1 m) with the UltraLift configuration. The fixed jib has a maximum length of 137.8 feet (42 m) in both basic machine and UltraLift. The maximum luffing jib length is 236.2 feet (72 m) for the basic machine and 275.6 feet (84 m) in the UltraLift configuration. The crane is powered by a 600-horsepower (447.4 kW) Cummins diesel engine with 1,845 foot pounds of torque. Hydraulically driven planetary gears raise and lower the load. Maximum line speed is 568 feet (173 m) per minute. The swing system uses dual drives and planetary gear reduction to automatically center the load and precisely regulate swing speed up to 1.8 rpm. The track roller system is maintenance free. A centralized system automatically lubricates the slewing bearing and other grease points on the crane.